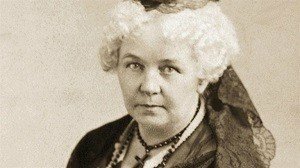 Elizabeth Cady Stanton, who was she? A dedicated mother and wife? A crusader or catalyst? A feminist, who hid her family’s past, while stealing credit for the work of others in the movement of women’s rights? A writer, public speakers and philosopher? For different people and in different epochs, this lady had a little from all of that. The results of her work are still causing hot debates even nowadays. But there’s one thing that one can be sure of: she was in the very heart of attention and successfully used her privileges to push her ideas about women’s rights. The starting point in Stanton’s career was in Seneca Falls, NY, where the woman impressed the public with her eloquence, during the gathering at the Richard Hunt home. In 1848, Elizabeth Stanton organized the famous First Woman’s Rights Convention together with Jane Hunt, Mary Ann M’Clintock, Marth Coffin Wright and Lucretia Mott. She was a student of Troy Female Seminary and that’s the place, where the woman realized how important the law was for the regulation of women’s rights. When Elizabeth Stanton entered her twenties, she was introduced to her future husband Henry Brewster Stanton, who later simply turned her life upside down. Even though her parents were against their marriage, the couple got married in 1840, departing immediately on a honeymoon to London. Between 1848 and 1862, Elizabeth Stanton worked the Declaration of Sentiments. Besides, she was engaged in the process of creation of the conventions in Rochester, Westchester, PA, as well as attended various national conventions during the period from 1850 to 1862. By 1862, almost all reforms were successfully repealed. That’s the year, when the family of Stantons moved to New York in 1862. In the early 1860s, the Civil War was in the heart of attention. A lot of men were the members of the Union Army. And even though the rights of women were put off to its annual conventions, in 1863, Susan Anthony and Elizabeth Stanton founded the Women’s Loyal National League that later gathered almost 400 000 signatures required to bring the 13th Amendment to the Constitution of the USA – to put an end to slavery. When the Civil War was finally over, the representatives of the women’s movement founded American Equal Rights Association – its first national organization – in order to gain the federal guarantee of the vote for every individual. It seemed like nothing could stop this brave lady. In the 1870s Elizabeth Stanton traveled all over the USA, delivering magnificent speeches. In her most frequent speech called ‘Our Girls’, Stanton urged females to enter colleges and universities in order to develop their personalities and get the desired income. It’s important to mention that Stanton’s daughters graduated from college. All in all, this woman was a complicated historical figure, who lived a long and eventful life and brought in many changes into the lives of people. And even though sometimes she contradicted herself, the world around her progressed for the better.